Students learn basic barbering skills as set by the Mississippi Board of Barber Examiners. Students train to become a licensed barber including haircutting, coloring and styling as well as manicuring, facials and shaving. In addition, students learn retail product sales, salon development and practice those skills in a model salon/lab setting. Total cost includes a registration fee of $150.00, kit and materials of $1600.00. If additional instruction is required after the contracted course length period, it may be provided at a cost of $15.00 per hour. Cash pay students are required to pay a minimum $1800.00 down payment. All students are required to make a monthly payment. Student monthly payments are determined by the Financial Aid Director after receipt of and consideration of approximate amount of financial assistance that could possibly be received from grants/scholarships, etc. and total determined and applied to the estimated cost of attendance. Chris' Beauty College will admit as regular students, high school graduates and holders of high school graduation equivalency certificates approved by the Mississippi Board of Barber Examiners. Chris' Beauty College does not accept ability-to-benefit students. A non-refundable application fee of $35.00 is required upon enrollment. 1330 are to be practical hours. Students must also maintain a grade average of 85% and successfully complete with a grade average of 85% any written or practical examinations. Tuition, books, materials and any additional instructional charges owed Chris' Beauty College by the student must be paid in full, or arrangements for payment made with the Director, in order to take any written or practical final examination. 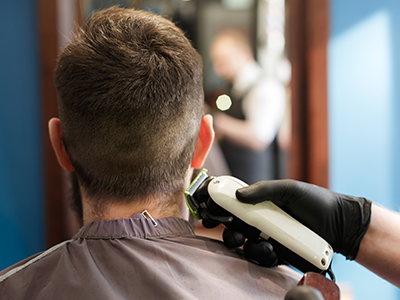 Upon graduation, a certificate is awarded certifying that the student has completed the course of study and training in Barbering from Chris' Beauty College. Attained a high school diploma or its approved equivalency. Successfully completed 1500 hours of training in an accredited Barbering college. Chris' Beauty College for the first year after graduation. Please see 2016 National Median Income and National Trends for barbering located on Page 42. You can access this information on WW\N.onetonline.org by inputting SOC 39-5011. A total of 170 hours in theory and 1330 hours of practical work are required, for a grand total of 1500 clock hours. Methods to be used for instruction include lecture, demonstration, and overhead projection of materials, CO-ROMs, PowerPoint, videos and activities that require student participation, discussion and review. Have knowledge of Mississippi State Laws concerning barbering. Develop the skills necessary for haircutting, shaping, and coloring. Know how to care for the scalp as well as the hair. Be aware of the hair and scalp structure and how to care for any disorders. Have the skill to perform a professional manicure. Have the skill to perform a professional shave. Be aware of all sanitary procedures and strictly abide by them. Be able to perform chemical solutions and coloring used on the hair. Perform professional permanent waving techniques and applied chemistry. Know the importance of projecting a professional image. Have a working knowledge of salesmanship techniques. Obtain sufficient knowledge to perform as a professional in the Barbering field.